Thanks to its flat and compact credit card format, the pocketcharger fits in any pocket. It is capable of charging either one or two power one ACCU plus batteries. Depending on the accompanying battery compartment insert chosen, it can charge power one ACCU plus batteries in the sizes 10, 13 and 312. The different inserts are included with the charger. Empty cells are completely recharged in only 2 hours. 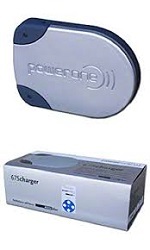 A convenience feature first drains partly charged batteries and thus improves the cells service life. The pocketcharger works independently of a power outlet. It is operated by means of a rechargeable lithium polymer battery. Once the lithium polymer battery has been charged, it can charge, for example, a power one ACCU plus p 312up to 18 times. Thus your energy supply is assured if there is no power outlet available when you are out and about. Clearly recognizable signal displays make for easy handling.